Sorry no weekend posts. Life got in the way...in lots of good ways mostly, but I'll be back to blogging early on Monday. See you then & hope you have a wonderful weekend. & some random links to clever ideas that some talented people have shared. Happy Friday! Older project, Newer stamps! This is an older gift set for the last Varks Winter Challenge that I hadn't blogged yet (slowpokey me!) ;o) but it uses some brand new Hero Arts stamps. 2) the HO! HO! 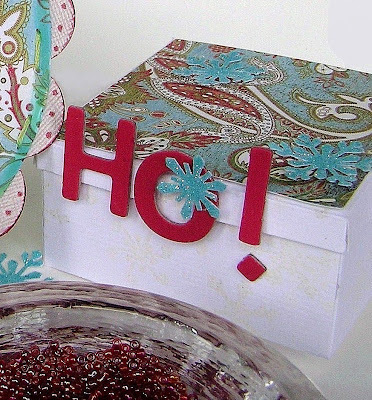 HO!s from "Holiday Sentiments"
2) Stamped HO! HO! HO! 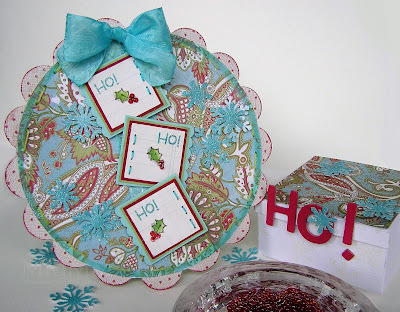 from their "Holiday Sentiments" set on in Distress Ink (Broken China) and embossed it with Iridescent Ice. D) Added three mats behind the berry images (red, green, & turquoise) and sewed on 3 stitches. 2) Folded a piece of 12x12 cardstock in half & cut to make a matching round card. 3) Stitched the patterned paper with green embroidery floss & edged it wit a copic marker to distress it. 3) Sandwiched them between the patterned paper & circle card. A) ...inking a piece of cardstock with a DIY turquoise tinted Versamark pad, adding heat'n'stick powder & Iridescent Ice glitter e.p. Heated after glittering to set it. C) ...snipping snowflake points with scissors to make varied shapes & sizes. Hope you have a lovely lovely weekend! I'M not leaving you comment often but just want to say I'm visiting you at each of your post and love looking at what you do. You are a source of inspiration! You are working so hard! Thanks for sharing with us all! This is GORGEOUS! I love the blue and all the detail you can pack into a 3x3 card=absolutely STUNNING! I have to admit I dont' want to look at holiday cards yet, LOL! But ANYTHING from Mel I go ga-ga over no matter WHAT time of year, woman! Fantastic project, Mel! Love the circle card and design of it! The box is so cute! Mel, I love your work and you never cease to amaze me with your creativity! Thx again for the wonderful share of your talents! Stumbled across your blog by accident, so glad I did, your creations are just amazing. I have had a go at making some creations with your fab templates, and just wanted to say thank you for sharing. 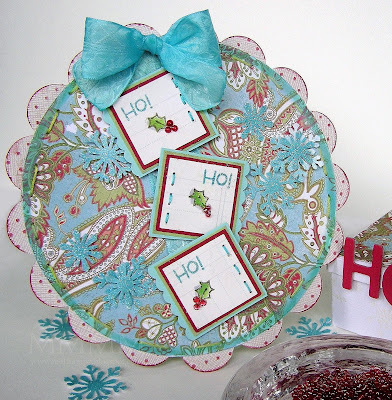 I really like the scalloped border on the circular card. Your way of doing the scallops in the round is something I need to remember. wow what a fabulous blog, lots of goodies here...tfs! So very pretty! Awesome creation! Oh no, not xmas already. ;o) Gosh, to think it's just 4 months away. I love the blue. I'm so a fan of non traditional colours for holiday cards. Can't wait to see all your halloween and xmas projects.